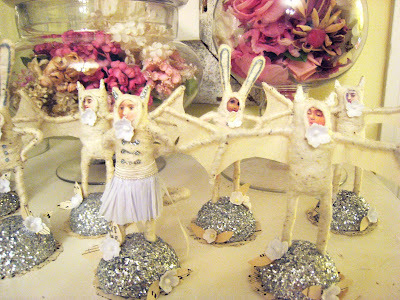 I've just finished a gang of white spun cotton bats, bunnies and cats (my most popular species to date). I did one set a few weeks ago and got such a great response and requests to make more that I decided to make several sets at once. Each figure is a little different. They're all individuals and like a mom I love them all equally... Two sets are going to Mariclare, a fabulous lady in New York. After everyone has found new homes, I'll still be making them to order, so if you're interested in owning one yourself, just send me a message! The bunnies have attitude, the cats are shy and the bats are carefree. 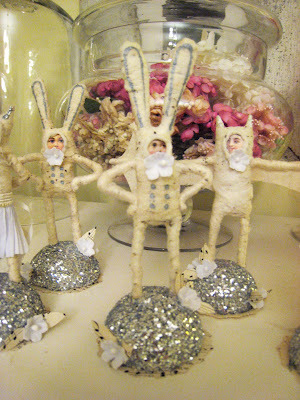 I normally created the bunnies for Easter and the bats for Halloween...but with their creamy color and silver glitter, they can be displayed all year round or in the cold months for a winter wonderland effect. It's up to you! 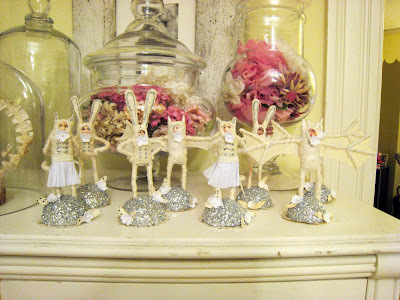 I wish I could keep them all together here on my cabinet...but I have to make room for kitties and bats! :) I'll be posting photos of my new patriotic figures soon, so check back in!